As soon as we realized the people of Vernonia could use our help, I sent out an e-mail to about 20 of my closest friends. 55 people showed up and we went to work. Ray broke people into teams of six and off they went. We both drove around keeping our teams fed with resources, materials, and food from the Red Cross relief center. I had two teams working down on Sheely Creek Rd. where no official rescue operation had yet surveyed. We found one mobile home that had been moved about 150 yards and was destroyed and another that looked fine on the outside, but upon inspection we realized it was totaled also. The owners of the second home were quietly working by themselves, sorting through the soggy rubble to uncover any valuables that may have survived. With one look into faces of Robin and her husband it was easy to see the aura of hopelessness. He told me everything was lost. Everything. Apparently a friend called them early the day of the flood and asked if the water was rising there. “We’re out of the flood plain and behind the dike,” Rick said. But he looked outside anyway and saw water filling his yard. By the time he’d gotten dressed and checked on the horses, there was about a foot of water in the yard and it was beginning to cover the driveway. The neighbor whose house was washed downstream called and asked for help evacuating his very elderly mother-in-law. 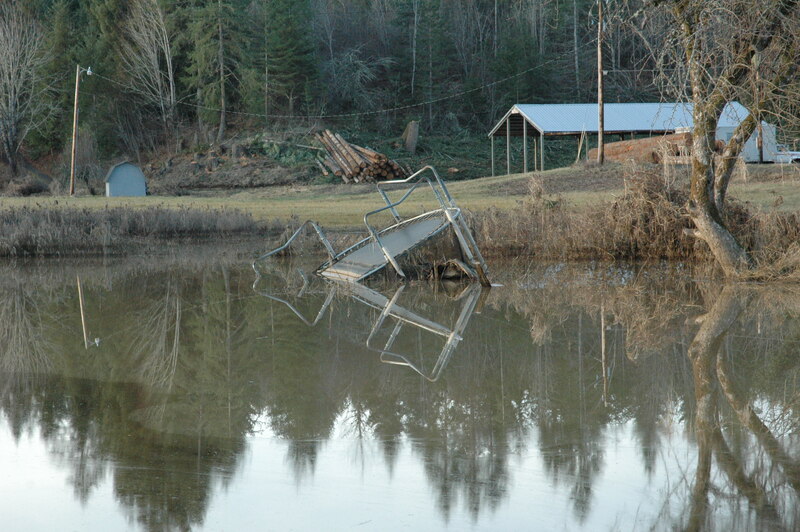 Rick pulled his boat over to the neighbor – walking in thigh-deep water. By the time he’d help evacuate the mother-in-law he had to walk back in chest-deep water. His wife, 17 year old son, and twin nine year old daughters were holed up in their house which was beginning to face the strain of the rushing water from Sheely Creek. Meanwhile volunteers and firefighters were rescuing people with boats, but their attempts to get down Highway 47 to Sheely Creek Rd were futile. One of our leaders, Ray, told me that they could see flares and hear shotgun blasts signaling for help, but they just couldn’t get in to help the families down there. 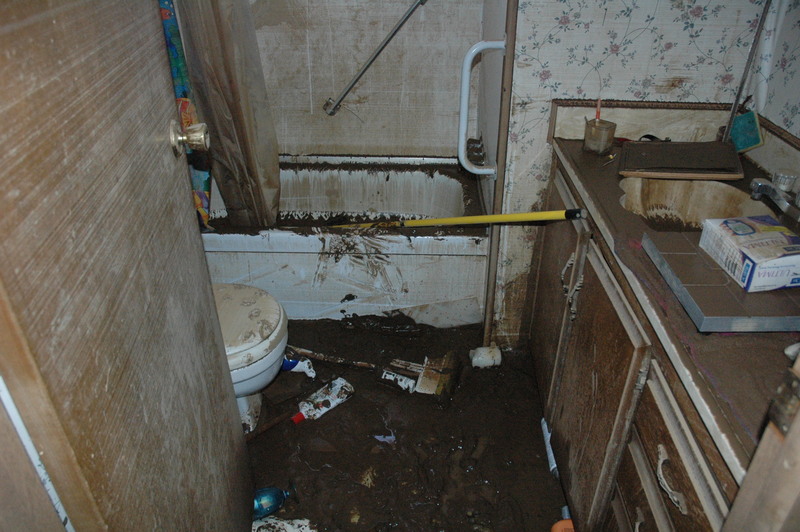 Rick’s family climbed up on the beds as water began to run through their house. The windows broke out and the mud and water poured in. He told me how very real the the threat of hypothermia was to his young daughters especially. Then at some point in the darkness something large slammed into the house. “Probably a tree,” he thought. A little later something larger hit the house with even more force. He was certain the mobile home would be knocked off its foundation and washed downstream. As a relatively new father I could only think about the fear Rick must have felt for his family. Hypothermia, drowning, and who knows what were very real possibilities during this dark night of uncertain disaster. Although he didn’t describe it in detail, I’m sure there were many tears, screams of fear, and much praying. The next day when the sun came up they got a sense of what death they escaped. The water receded and Robin and Rick, along with their kids, were able to escape the shelter that used to be their home. They were alive, but wet and cold. After borrowing clothes from friends and family, they came back to survey the damage. That’s when we arrived. Unfortunately, they were unable to salvage much more than a pickup load. The look of hopelessness was made even more real with the fact that they didn’t have flood insurance and they lost everything except their lives. But don’t blame them for not having flood insurance, they were told that they were out of the flood plain and the very expensive insurance wasn’t necessary. What could I do, but wrap my arms around them and pray. This is so terribly sad. One feels lucky to live on a hill until it slides away out from under them.